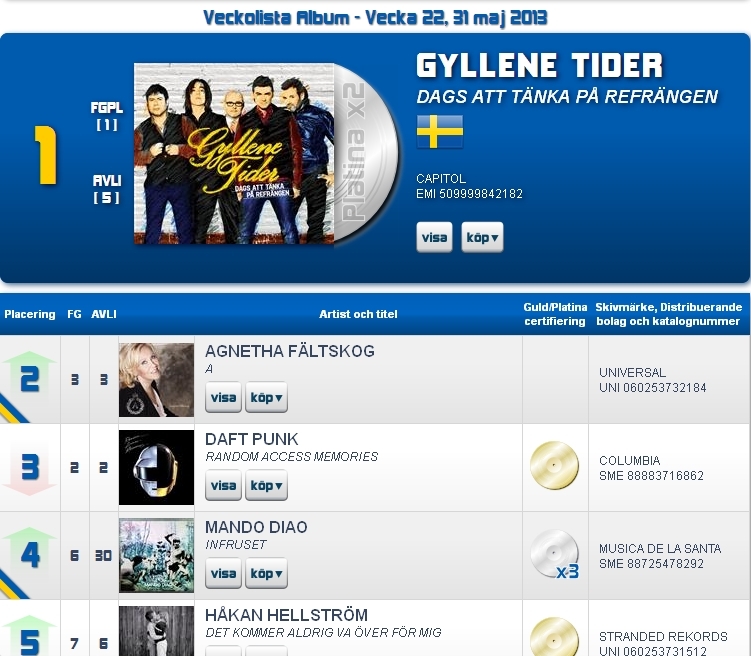 Gyllene Tider #1 in Sweden: 5th week in a row! Gyllene Tider’s latest album is still No. 1 for the 5th week now. Yay! The already gold, platinum and double platinum record, Dags att tänka på refrängen entered the Swedish album charts on 3rd May, 2013. Gyllene Tider’s previous (5th) studio album, Finn 5 fel! stayed on the charts for 28 weeks. First six weeks at No. 1, 7th week at No. 2, but got back to No. 1 for the 8th week. F5F! is a gold, platinum, double platinum and triple platinum record. Congrats to the Fab Five!